Shaped like a hexagon, super soft and with a wonderful drape, this beautiful baby blanket with an ombré effect is certain to soon become one of your favorites. 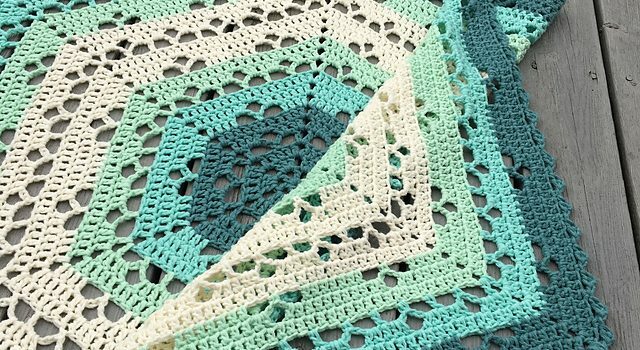 Such an amazing hexagon shaped baby blanket free crochet pattern! Cloudberry Blanket by Johanna Lindahl looks absolutely lovely. Directions are given also for bigger sizes. This baby blanket would be a perfect blanket for a summer baby too as well as a summer girl. If you use the same yarn and gauge as indicated in the pattern this blanket will measure approximately 85 cm between two tips, and 75 cm between two sides (measured across the blanket). Get the free crochet pattern here: Cloudberry Blanket Free Crochet Pattern. Thanks to Johanna Lindahl for the article inspiration and featured image.